Finding a place to do your laundry when you travel can be the easiest and the hardest chore. When we travelled around South East Asia for 8 months in 2008 we got in the habit of keeping an eye out for a place that could do our laundry for us, I’m not a big fan of huge piles of hand washing. Although I have many memories of discovering a plug for the sink in our guesthouse bathroom and thinking “yay I can do washing”. Sometimes it could be a struggle to find a laundry place that charged by the kilo instead of by item – so you get use to keeping a running log of potential places. Even now when we take a trip out of Bangkok I can’t help but notice the laundry places even though we are normally only away for a few days and won’t need to do laundry. 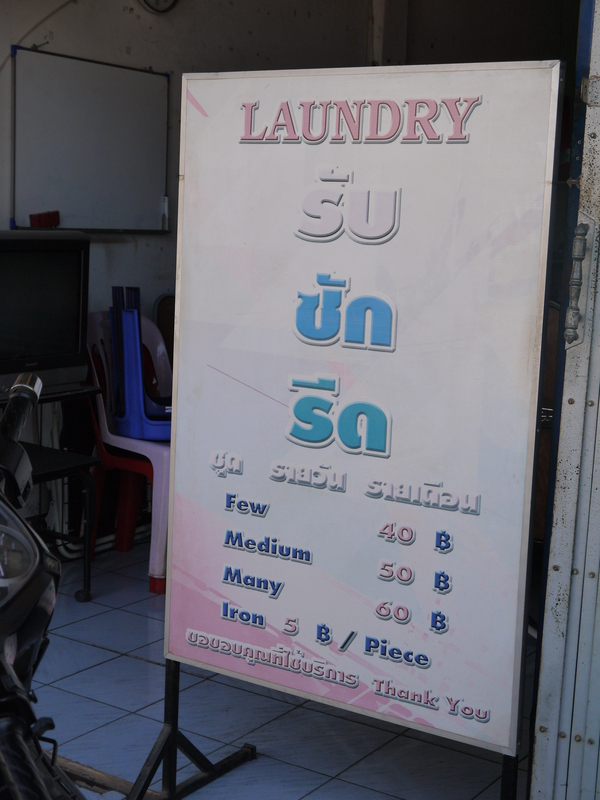 On our recent trip up to Nong Khai in North East Thailand we found this Laundry place. We thought they had an interesting way of calculating the cost. I’m still trying to figure out whether a few means – 1 or 2 or 3 pairs, kilos or piles . Not to mention the meaning of medium and many. Maybe it’s the kind of place where you get to determine what it means, if so it might just be a real bargain! Unfortunately we didn’t get to find out. However we do get to enjoy doing our laundry ourselves using the shared communal washing machines underneath our apartment building. It’s quite common for Bangkok apartments not to have washing machines and shared communal ones can be found everywhere, even on the street. It’s pretty cheap only 20-30 Baht a load. Most places either charge by the Kilo or charge per each individual clothing item. The price per kilo option is almost always cheaper, unless you have a lot of heavy items like thick jeans. Most summer clothing though in Thailand is thin and light with makes the former option the best.